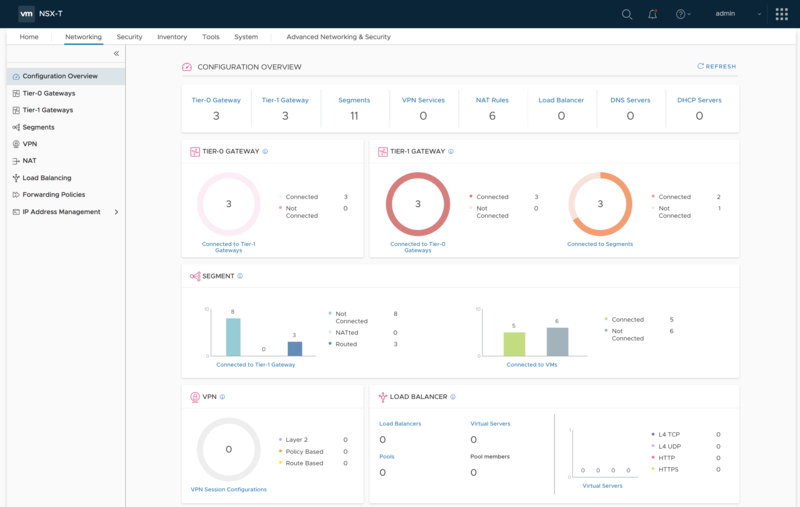 VMware releasing NSX-2 2.4 which is a major release of the product. VMware has NSX-V and NSX-T. Where NSX-V is tailored for environments running VMware vSphere, NSX-T is designed for multi-hypervisor environments. NSX-V is part of a software-defined data center and it needs VMware vCenter server as it’s tightly integrated into. Previous releases of NSX-T has introduced Geneve protocol to create tunnels across transport nodes, and that’s where the overlay traffic flows. NSX-V on the other hands continues to use VXLAN. Moving forward, VMware recommends, especially for green fields deployments, going for NSX-T. The new release also introduces a new set of wizards allowing you to transition from NSX-V -o NSX-T and do in place migrations. One of the best use cases for NSX was Micro-segmentation. It allows your organization the move from a perimeter-centric security posture to a micro-segmented architecture with enhanced security and visibility. This release is made for simplicity and ease of use. This release brings a number of operational enhancements that makes it easy to install, upgrade, and operate consistently, accelerating Day 0 installation to Day 1 provisioning from days to minutes, and significantly simplifying Day 2 operations for administrators. VMware NSX-T 2.4 – What’s New? Image from VMware blog post. Fewer VMs for Installation – the 2.4 release has lowered the needs when it comes to number of VMs deployled by the solution. Because of the convergence of management and control plane nodes, fewer VMs are needed. Simplified UI – simplified user interface (UI) where the product collect just minimum from the user, offering strong default values with prescriptive guidance for ease of use. Fewer clicks and page hops are required to complete configuration tasks. Reboot-less maintenance mode upgrades – also in place migrations, and transition from NSX-V -o NSX-T.
I’m assuming that the PDF might get updated with the latest 2.4 release soon. VMware blog can be found here. I’m starting with NSX, in your opinion is it worth going straight to learning NSX-T? Will the NSX-V be discontinued soon? To be honest, I’m new to it too, but it seems that while NSX-v was there before, and it will still be supported in the future, it seems that VMware’s approach with NSX-T is more universal. As such it will be the privileged version in the future. One problem: VMware does not allow NSX-T to be downloaded without being a vExpert or spending a lot of money. It’s not available on VMUG even though the license key for NSX-V works with NSx-T. So I can’t build on NSX-T foundations in my testlab and can’t learn PCF either.